Rusty orange crystals of Creedite forming a radiating ball. Light lavender tabular Fluorite crystals on matrix. These are said to fluoresce red but we do not own the equiptment. Large and heavy copper on matrix. These are taken from the mine cleaned in a acid bath and sealed to prevent them from weathering to a dark patina. Thumber of bright orange Mimetite on matrix with Orange panes of Wulfenite on matrix. 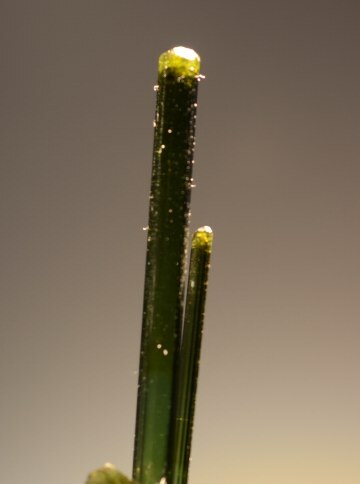 Green internally gemmy crystal of Foresterite (Peridiot) with a crystal of Magnatite imbedded. Gemmy thick orange Wulfenites in a bright cluster. This specimen is from the Minette collection and comes with their label and data card . from the classic Mammoth Saint Anthony mine. From our personal collection. several crystals of transparent Quartz crystals. Small specimen of fine bladed crystals of Azurite partially pseudomorphed to Malachite. Transparent highly modified pseudo cubic Calcite crystals on matrix. From the Fenn find of 1969.
transluscent stem of Quartz forming a knockout scepter. Could use an acid bath to remove small iron stains. Large specimen of sparkly Mimetite crystals on matrix. 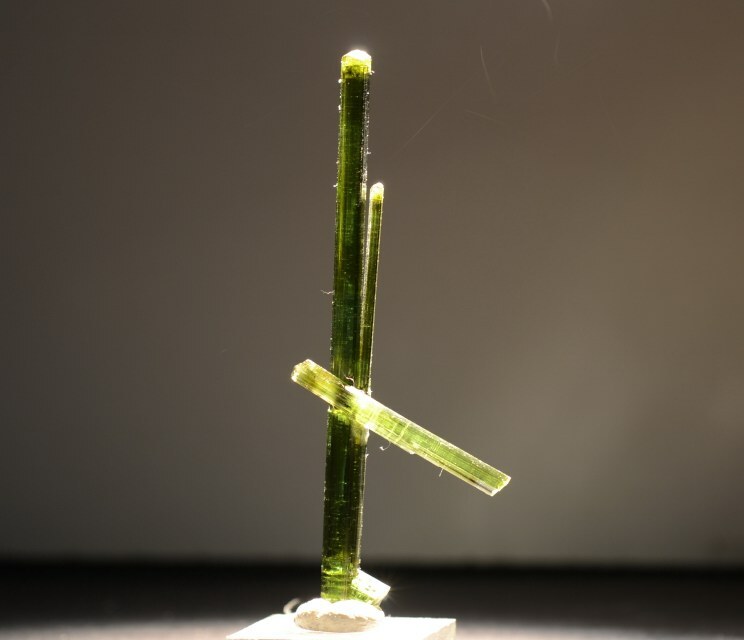 A pencel of gem green Tourmaline with a parallel crystal and a crystal thar grew accross the specimen. Purple cube of Fluorite on matrix. The edge is not cleaved it is a internal fracture. Some small rat bites. Yellow radiating crystals of Mimetite form spheres on a contrasting limonite matrix. Good seperation of the crystals. Union Carbide produced Emerald. Great color. Unique man made stone. Colorless stacked tabular crystals of Beryl . Water clear prismatic double and single terminated crystals of Calcite. Wonderful specimen out of our personal collection and comes with our collection label. Orange red fans of Hemimorphite on matrix sprinkled with Calcite. Burnt orange crystals of Vanadinite capped with druzy Calcite. The back of the specimen has a druze of Calcite as well as larger Calcite crystals.